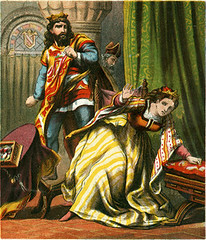 Valentine and Orson, Publisher Mc Loughlin Bros Images from Baldwin Library of Historical Children's Literature, George A. Smathers Libraries, University of Florida. 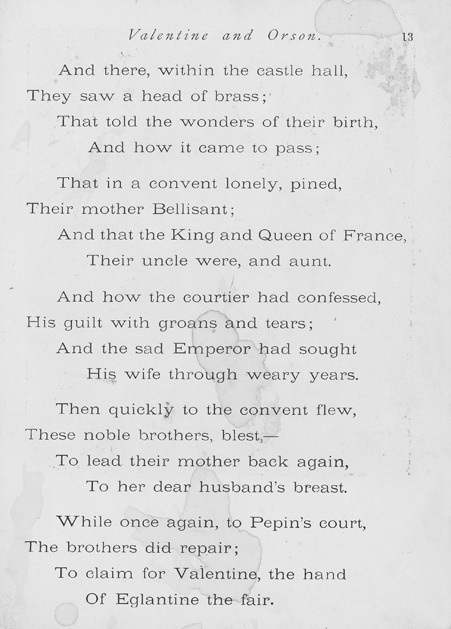 THE EMPEROR'S CRUELTY TO BELLISANT. 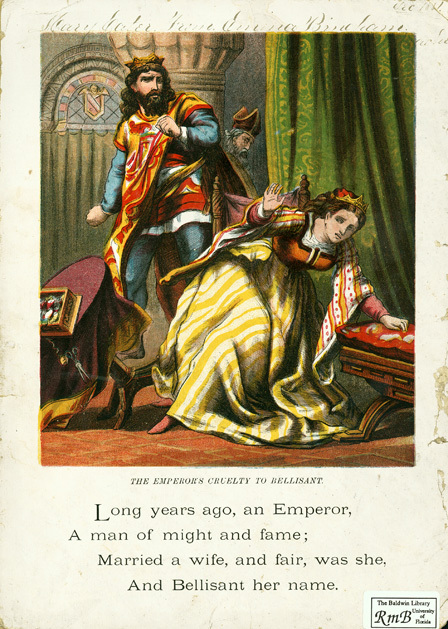 Long years ago, an Emperor,A man of might and fame;Married a wife, and fair, was she,And Bellisant her name. 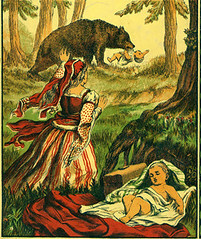 ORSON CARRIED AWAY BY THE BEAR. And true and happy were their lives,Until an envious man;A courtier, high in place and trust,An evil tale began. 4 Valentine and Orson. 'Twas said, this lady did not love,Her royal husband dear;And thus an honest wife was made,Untruthful to appear. The Emperor believed the tale,And drove her from his side;And through the cruel forest glades,She wandered far and wide. 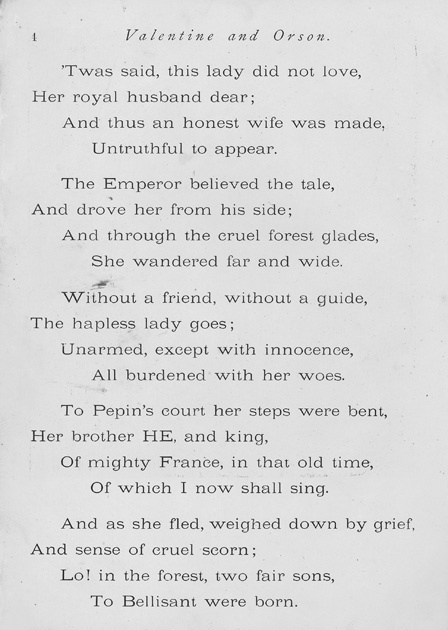 Without a friend, without a guide,The hapless lady goes;Unarmed, except with innocence,All burdened with her woes. To Pepin's court her steps were bent,Her brother HE, and king,Of mighty France, in that old time,Of which I now shall sing. And as she fled, weighed down by grief,And sense of cruel scorn;Lo! in the forest, two fair sons,To Bellisant were born. Valentine and Orson. 5 All weak and suffering she lay;Yet with a mother's joy,She pressed her babies to her breast,And kissed each lovely boy. And now, with her returning strength,The poor, unhappy wife,Began to seek her brother's court,And pray for health and life. 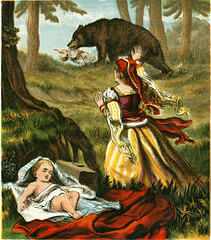 One day, while her attendant wentFor food, a great she-bear,Sprung from a copse, and bore awayONE child unto its lair. 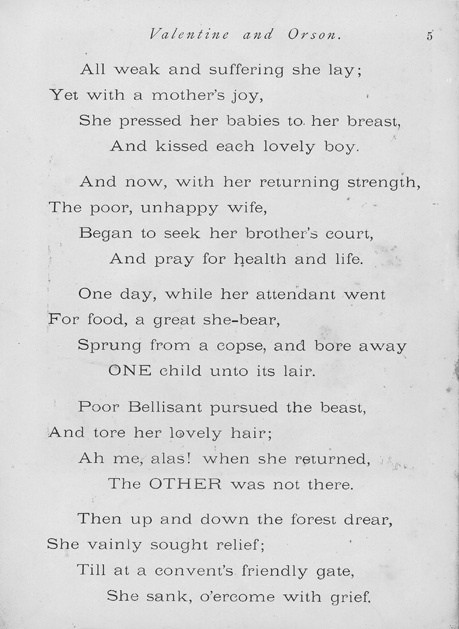 Poor Bellisant pursued the beast,And tore her lovely hair;Ah me, alas! when she returned,The OTHER was not there. Then up and down the forest drear,She vainly sought relief;Till at a convent's friendly gate,She sank, o'ercome with grief. 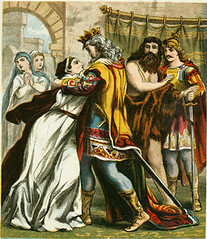 VALENTINE FOUND BY KING PEPIN. And long in sorrow there she dwelt,For many a weary year;Believing cruel Death had borne,Away her children dear. 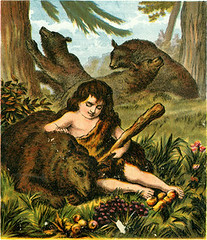 YOUNG ORSON PLAYING WITH THE BEARS. Now Pepin chanced, that very day,To hunt with all his train;In that same wood, and found the child,Ere she came back again. 8 Valentine and Orson. 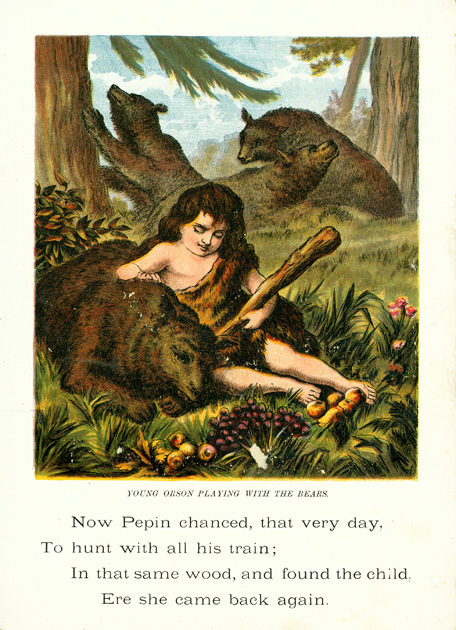 Said Pepin, "this is very strange,This boy shall now be mine;He'll make a pretty play-fellow,For litle Eglantine." 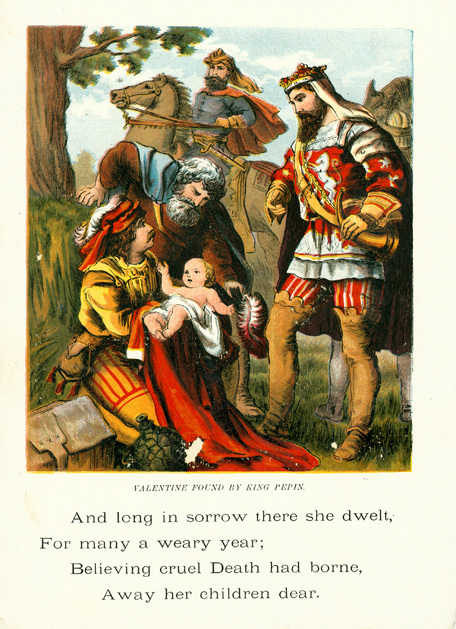 "And by my faith," the king went on, "I never wrote a line;Yet I will rhyme his name with hers,And call him Valentine." Thus reared within that noble court,A knight he soon became;Whose courtesy and valor blazed,Upon the roll fame. And all his noble deeds were done,In praise of Eglantine;Who, though her brothers hated him,Loved gentle Valentine. 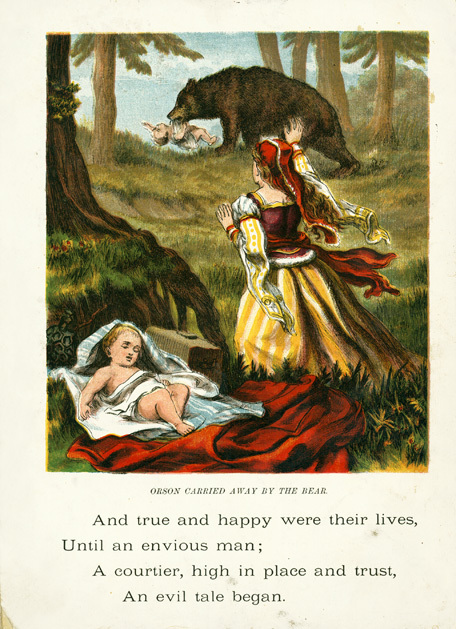 And now, how fared the tender babe,Borne off while still alive?The wild bear nursed him tenderly,And nobly did he thrive. Valentine and Orson. 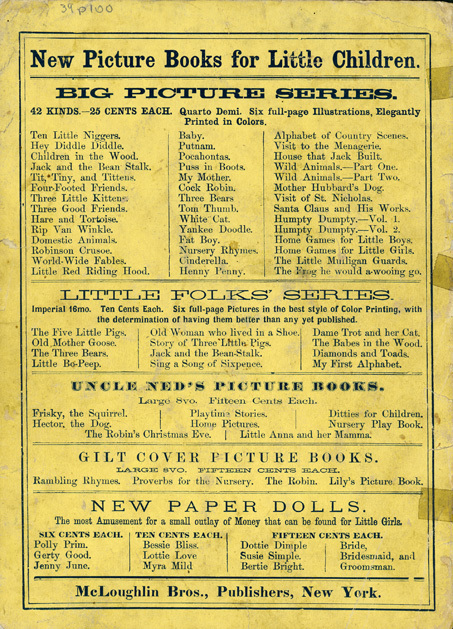 9 Trough all the country round about,As Orson, he was known;And with him roamed his brother bear;He never went alone. And Pepin's knights, though armor-clad,With sword and lance complete,Whene'er they fronted Orson's might,Were crushed with sore defeat. Then said the gentle Valentine; "I'll seek this monster, whenHe thinks himself secure and safe,I'll beard him in his den." But scarcely had he reached the wood,When Orson came in sight;And man and beast, with horrid yells,Rushed fiercely on the knight. 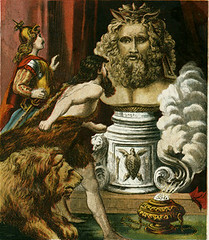 High in the air, a mighty tree,Does Orson lightly wield;Then drops it, with fearful clang,Upon his foeman's shield. 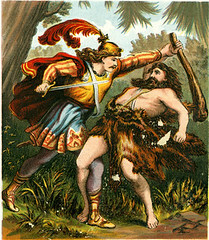 THE COMBAT BETWEEN VALENTINE AND ORSON. 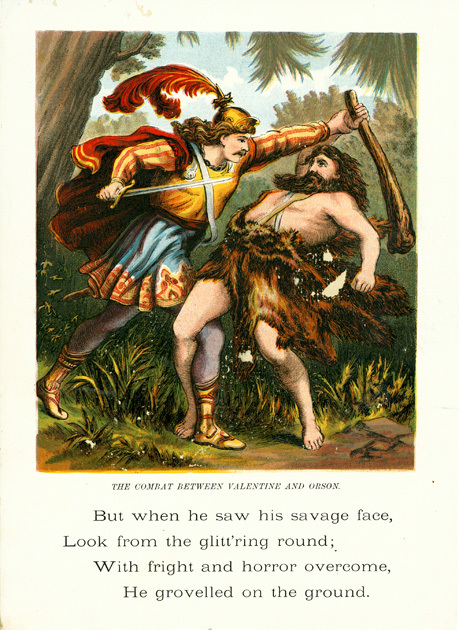 But when he saw his savage face,Look from the glitt'ring round;With fright and horror overcome,He grovelled on the ground. 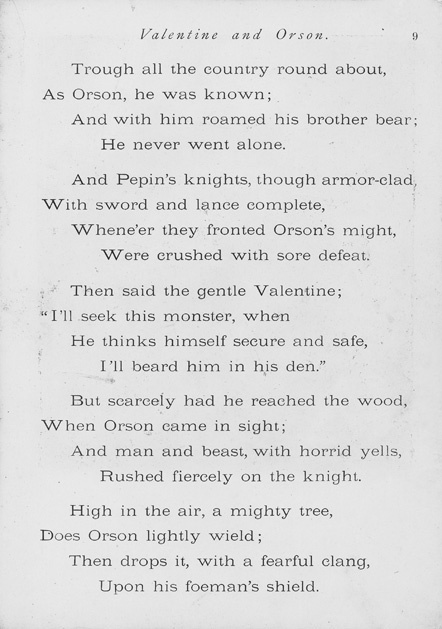 Then Valentine, with lifted blade,And fiercely gleaming eye;Unto the kneeling monster said, "Yield quickly, or you die!" 12 Valentine and Orson. 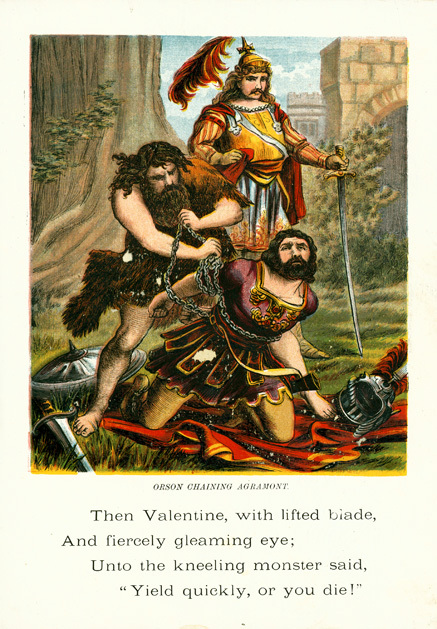 So Valentine was conqueror.Brave Orson owned his might;And lovingly he followed him,And served him day and night. And thus we see how time and tide,Brings many a wondrous thing;—One brother reared by savage bears,The other by a king. 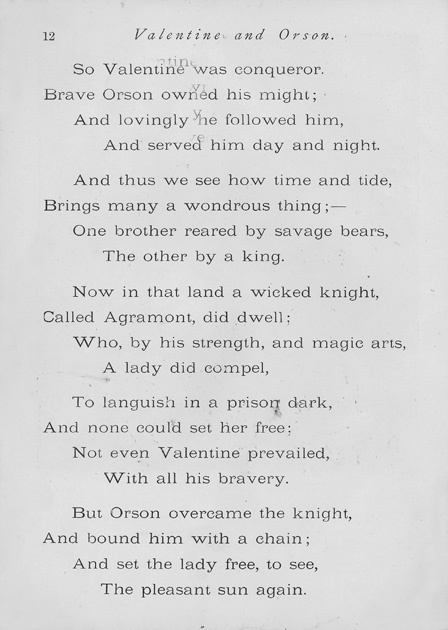 Now in that land a wicked knight,Called Agramont, did dwell;Who, by his strength, and magic arts,A lady did compel, To languish in a prison dark,And none could set her free;Not even Valentine prevailed,With all his bravery. 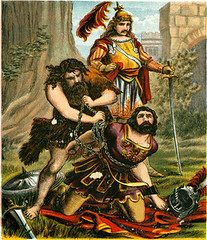 But Orson overcame the knight,And bound him with a chain;And set the lady free, to see,The pleasant sun again. 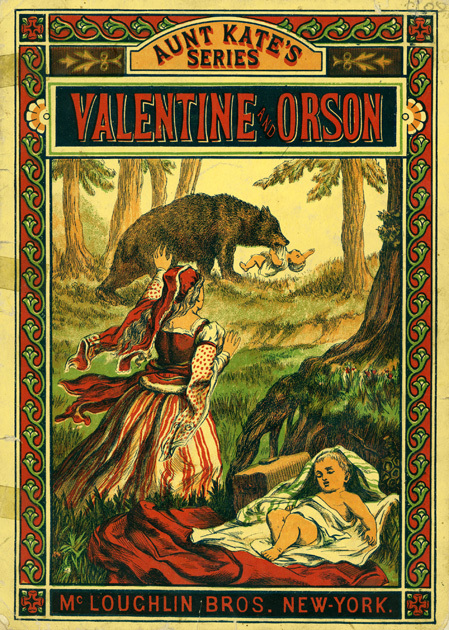 Valentine and Orson. 13 And there, within the castle hall,They saw a head of brass;That told the wonders of their birth,And how it came to pass; That in a convent lonely, pined,Their mother Bellisant;And that the King and Queen of France,Their uncle were, and aunt. And how the courtier had confessed,His guilt with groans and tears;And the sad Emperor had soughtHis wife through weary years. Then quickly to the convent flew,These noble brothers, blest,—To lead their mother back again,To her dear husband's breast. 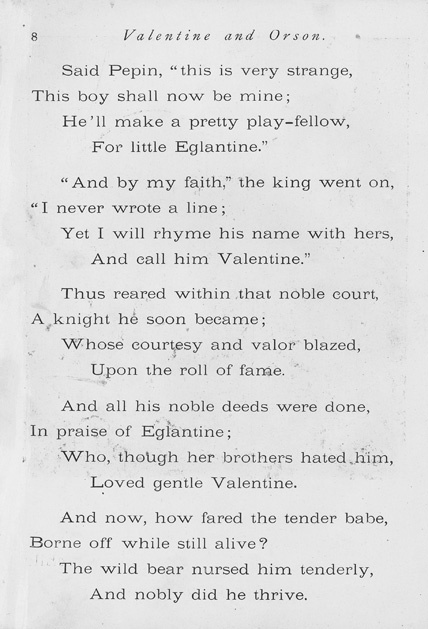 While once again, to Pepin's court,The brothers did repair;To claim for Valentine, the handOf Eglantine the fair. 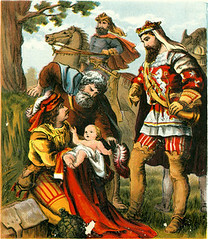 THE BROTHERS CONSULTING THE HEAD OF BRASS. 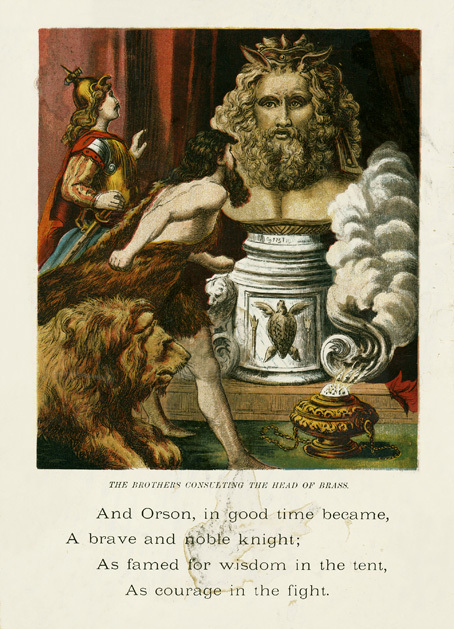 And Orson, in good time became,A brave and noble knight;As famed for wisdom in the tent,As courage in the fight. THE EMPEROR FINDS HIS LONG-LOST WIFE. 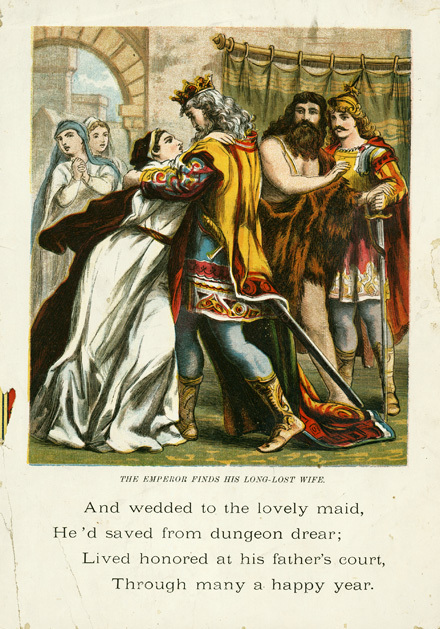 And wedded to the lovely maid,He'd saved from dungeon drear;Lived honored at his father's court,Through many a happy year.